LOS ANGELES, CA – Bring on everybody. We’re not afraid to fight anybody. This in a nutshell was how four-time Trainer of the Year Freddie Roach reacted to insinuation that world eight-division champion Manny Pacquiao is avoiding fighting African-American. “We’re not ducking anybody. We’ve been very vocal about that. Manny has said that often. I have said that many times,” Roach said by way of reacting to a statement made by Bernard Hopkins that the reigning junior welterweight and junior middleweight belt-holder has not faced top African-American fighter. He then mentioned names he said Pacquiao might possibly fight in his next outing – World boxing organization and World boxing Association lightweight titleholder Juan Manuel Marquez, World boxing Council welterweight kingpin Andre Berto, six-time champ Floyd Mayweather Jr. five-time titlist Shane Mosley and even the winner between WBC junior-welter champ Devon Alexander and WBO counterpart Tim Bradley who are facing each other on Jan. 29. Roach, who just guided Pacquiao devastate Mexican Antonio Margarito barely two weeks ago for the WBC super-welterweight title, brandied Hopkins’ statement as racist. “I don’t know why some people make racist statements like that. Wed don’t need those kind of statements in boxing. Bernard should know that boxing is not about skin color. It’s about business,’” he emphasized. “We won our first title against Lehlohonolo Ledwaba, a South African. We also beat Joshua Clottey, who is from Ghana. So, we’ve beaten two black guys. This is sport, let’s get on with sport,” Roach said. “So, we’ve beaten two black guys. But this is sport, so, let’s get on with the sport,” he pointed out. “Mosley is another black American, who we are considering to be one of Manny’s opponents. He hasn't looked that good in his last couple of fights, but he's still a very good fighter. 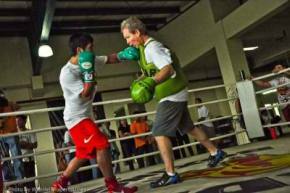 He's a very good possibility to be Manny's next opponent, “ he intimated. “Marquez knows Manny and knows what gives Manny trouble. Marquez has proven that in two fights. Both fights went the distance. Marquez has been down four times in the two fights, but he's gotten up and made the fight. Marquez is a very durable guy and he's got an audience and a fan base behind him. So he's marketable.